"Rowdy ridin high in the saddle again"
Hate him or love him, Kyle Busch is hittin on all 8 again it seems. Turning the competition into as us Southern folk would say..."Boiled Cabbage"
Third time is the charm as Kyle Busch wins the Cheez-It 355 at Watkins Glen 2013 after coming so close the last 2 years. Road course, short track or the super high banks. Kyle seems to have all his past and present emotions in check! Never have I seen Kyle in such relaxed form as he is now. 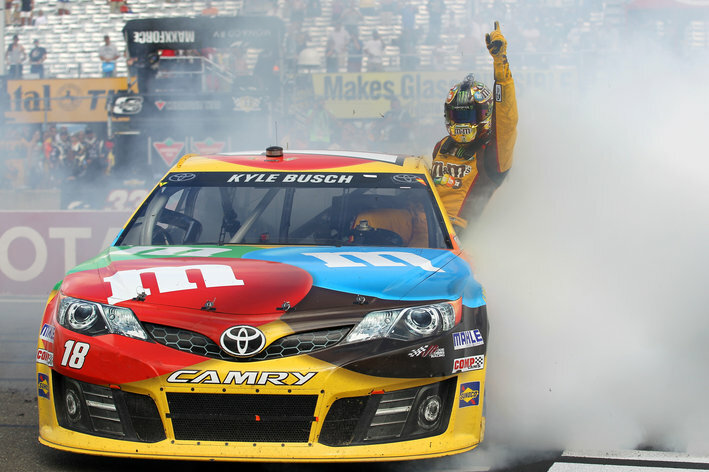 Be it his wife who is keeping him anchored, or the thrill of victory which seems to be the only thing that makes Kyle Busch happy. Busch collected his third win of the season, his second at the Glen and the 27th of his career but nothing about it was easy. Thanks to Brad for being nothing but a gentleman this year bumping and pressing Kyle, but never spinning Kyle for the win as he was less of a gentleman in the past. Points leader Jimmy Johnson never a factor in Sunday's race. Gonna go out on a limb here which I'v been known to do...and say Sundays winner at the Glen will be this year's Sprint Cup Champion! I bet ya a hot dog when it's all said and done, Kyle Busch will take the 2013 Sprint Cup championship which has escaped him years in the past!! Oh no Snuss...JJ gonna stumble in the chase!!! Yee hee...RowdyCowgirl gonna get you tombo! Hell yeah!!! Seems to have all his M&M's in a row this year!! Matt coming over has helped ground him and he made more points then the guys in the Chase last year....lol. Now, if TRD gets theIr stuff together...he should be able to do it.